My first apartment out of college was the bottom floors of a shared townhouse in Boston with three other buddies from school. When one moved away, we pulled in Catherine Ressijac, a friend of a friend who was a year younger from Harvard. When Catherine, or "The Ress" as we call her, visited a rhino sanctuary in rural Zimbabwe on vacation last winter and never came back, the rest of her roommates from 9 Symphony Road promised to come visit her new job and life. So after the end of my training in Cape Town on the first day of 2015, I joined the rest of my old roommates on a flight bound for Zimbabwe, heading for The Ress. Down a bumpy mostly paved road three hours southeast of Harare sits Imire Rhino & Wildlife Conservation, an 11,000 acre wild game reserve and The Ress' office and home for the past year. We crammed five people into The Ress' log cabin overlooking a swamp where her nearest neighbor is the hippo who lives in it. Ress' new 9 to 5 started at 5 AM, feeding the elephants and checking in on the endangered black rhino and it's new baby. By mid morning we were informed that a meddling warthog had been attacking the baby rhino, and therefore had been shot. Right. The rest of us watched in awe as Ress casually helped divvy up the warthog as dessert to a very hungry lion and pack of hyenas. Lunchtime was PB&J's before visiting the elephant who thinks he is a buffalo, along with his buffalo friends. Later it was on to happy hour, climbing up wood ladders with a cooler of beers to the top of a rock overlooking the park, sipping ice cold Castle Lights as sunlight faded around us and night creeped in across the plains. 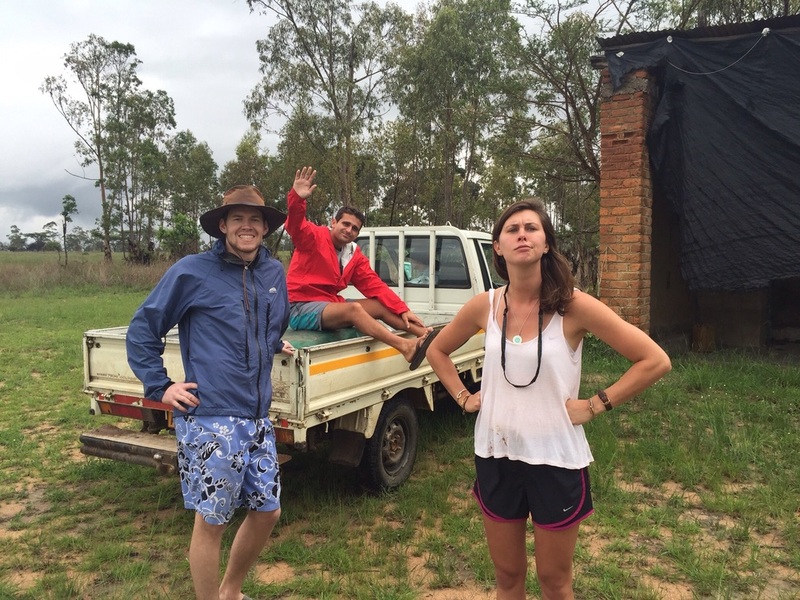 Our crew of old roommates canoed along the Zambezi river that splits Zimbabwe and Zambia, shared stories of new apartments, cities and roommates while drifting past more elephants, making friends with a few hundred hippos. In Mana Pools National Park we zipped around zebras and impalas, got our truck stuck and eventually unstuck in mud next to the pack of warthogs and at night, listened to the lions roaring nearby and rested easily because, as the locals told us, "hungry lions never roar." Before leaving for Zim I had been told of it's natural beauty, told there wasn't a sunset quite like the sunset along the Zambezi. Cotton candy pink and burnt orange and dark red streaked the sky, reflecting off the still river. Behind us, a dozen sets of curious hippo eyes watched patiently from the water. 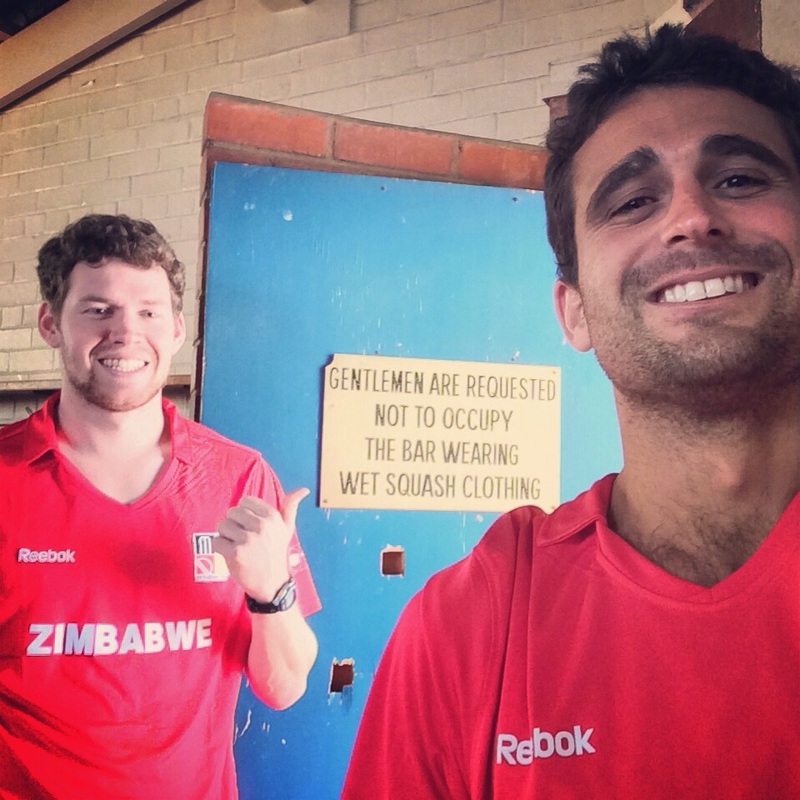 Amidst all this I was still training- a few weeks earlier I was given a qualifying spot into a Wimbledon-like pro squash tournament coming up in NYC, so Zimbabwe became the unlikely base for my prep. In Victoria Falls my taxi wove around throngs of unruly baboons and past peddlers selling old trillion dollar Zimbabwean currency notes, taking me to the only set of courts on the outskirts of town. In the basement of a hotel I arrived at the courts doubling as a time machine going back fifty years. The door creaked open and a few moths danced around the light pouring in for the first time in a while. Dust sprang up from the blackened hardwood floorboards during footwork drills as wall spiders looked on in amusement during sprints and hitting routines. In Harare I hit with Andrew, a British-Nigerian hospitality entrepreneur and friend of my former college assistant coach Busani. Andrew runs Amanzi, a top notch farm-to-table restaurant and lodge in town, a must if you ever make it through. Our final night in Africa hadn't yet been planned when I got an email the day of, in all caps, from a woman named Rosalind Millar. In all caps, Ros invited all six of us to crash at her family's home in Harare. We met her husband Henry at the airport a few hours later, climbed into his pickup and thanked him for having us. We promised not to impose, expecting floor space and, if we were lucky, a few couches to spend our last night on. Henry and Ross had planned otherwise. We arrived at their home to a full scale Zimbabwean braii (aka barbeque) thrown in honor of the visiting Americans. Their daughter Katie had a dozen friends over and before bags were dropped, beers were poured and and drinks were mixed and meats were grilling, all setting up for the grand finale: a night out at the local spot in Harare, Tin Roof. We ate and drank and stormed the Tin Roof alongside lifelong Hararians, forming an unlikely wolfpack that you wouldn't have guessed came together a couple hours earlier. Somewhere in all this I laughed trying to remember how we got here: Henry and Rosalind are my high school friend Megan's friend from home Lauren's mom Desi's best friend Tanya's sister and her husband, who I had just happened to sat down next to at Christmas dinner two weeks earlier in South Africa. During a drive earlier that evening with Henry, bumping along unfinished construction sites and pothole-riddled roads, he told us of a different, earlier Zim: it's days as British Rhodesia, an African agricultural and economic powerhouse under colonial rule, more advanced than South Africa and with a quality of life unrivaled on the continent. "Even after the war for independence, in 1980, the Zim dollar was valued 2:1 to the British Pound." Henry paused the story to point out that next to our one lane road was asphalt designed for a four lane roadway that is over ten years in the making, plagued by chronic corruption of the funds given to the project. We slowed to a stop behind the growing line of cars ahead in our one lane road. After some silence, Henry finished his thought about the government that took over newly independent Zimbabwe in 1980- about how, at that time, "they had a goldmine here." That was thirty-five years ago, just as Robert Mugabe took over the goldmine. Driving to the Royal Harare Sports Club the next day for a training session a few hours before my flight, we passed the road leading to Mugabe's estate. It's patrolled by the military and is closed daily from 6 PM to 6 AM in their attempts to thwart any potential assination attacks on Mugabe. I thought the road closure and automatic weapon patrol unit seemed a little excessive although my friend in the car made a good point: "I guess if you want to become a dictator it kinda comes with the territory." Directly next door to Mugabe's estate, the courts at the Royal Harare Sports Club contrasted the new regime being a remnant of the old. British influence was everywhere, with signs in the locker room stating that "Gentleman are requested not to occupy the bar wearing wet squash clothing." Looking at the bar my guess was the last gentlemen to occupy it in any clothing was before my lifetime. Vintage oak plaques surrounded the center show court, celebrating the Rhodesian squash champions of the 1960s. Resting in darkness behind locked entry doors, you get the feeling the court and its showcase hadn't been touched much since then. Out the back of the squash facility, Canada was taking on Zimbabwe in a national cricket match set against an aging wooden stadium that looked like a mix between the one from The Sandlot and Field of Dreams. The scene was a clash of eras- colonial style squash and cricket setups bumping up next to a modern dictators palace and his armed guards. This was where things seem to stand for the country today, some part 1960s British Rhodesia and some part Mugabe's Zimbabwe of 2015. I wondered what comes next.